Every company has potential to make a Deck of Cards to promote their ideas. Sometimes the card deck is for Inspirational Cards to motivate, or Trading Cards to show off valuable personnel, or perhaps Educational Cards to help reinforce company values. 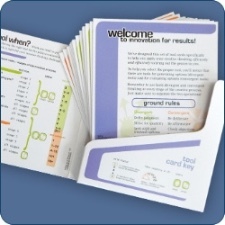 We have fun making these cards offering many papers, finishes and bindings to make your card decks appealing and useful. Let us know what you have in mind, and we will make them a reality for your organization.